OilFree is a patented polymeric technology that is applied to all Oilfree filter cartridges and related technologies. The Oilfree solution removes hydrocarbons from water, emulsified polluants from water, PCB’s, BTEX, oily sheen, synthetic and natural oils, solvents and organically bound metals from water. The OiFree technology is engineered to remove hydrocarbons from water, instantly. OilFree immobilizes and permanently bonds the hydrocarbon compounds without developing pressure. The OilFree technology removes oily sheen, synthetic and natural oils, BTEX, PCB’s, solvents and organically bound metals. The pressure drop across a saturated OilFree cartridge is less than 1 psi. 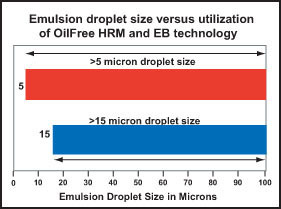 Oilfree technology is available in turn-key systems with operational ranges from 1 gpm – 5000 gpm. 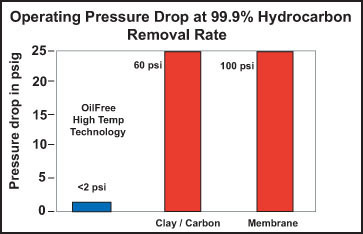 The OiFree technology is engineered to remove hydrocarbons from water instantly. OilFree immobilizes and permanently bonds the hydrocarbon compounds without developing pressure. The OilFree technology removes oily sheen, synthetic and natural oils, BTEX, PCB’s, solvents and organically bound metals. 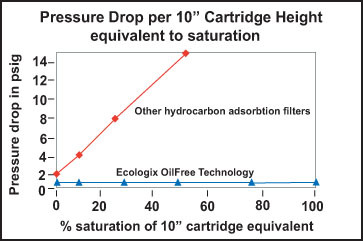 The pressure drop across a saturated OilFree cartridge is less than 1 psi. Oilfree technology is available in turn-key systems with operational ranges from 1 gpm – 5000 gpm. The cartridges exhibit low pressure differential, no moving parts and will not desorb while treating a wide range of polluants. OilFree High Temperature Cartridges incorporate a high temperature tolerant version of OilFree technology which immobilizes and bonds the hydrocarbons instantly on the filter surface. OilFree High Temperature technology is employed as a stand alone unit or as part of turn-key systems for high temperature waste water filtration applications which are economically sensitive to pressure drop and temperature drop. OilFree PCB filters are designed to remove low levels of all types of PCB’s (Polychlorinated Biphenyls) down to allowable discharge levels (typically 65 ppt). OilFree instantly solubilizes the PCB compounds and bonds them to its surface, preventing any release. OilFree cartridges can also remove low level BTEX (Benzene, Toluene, Ethylbenzene and Xylene) components.